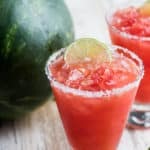 These super fun inside a watermelon margaritas recipe is awesome and a blast for your next Summer gathering. 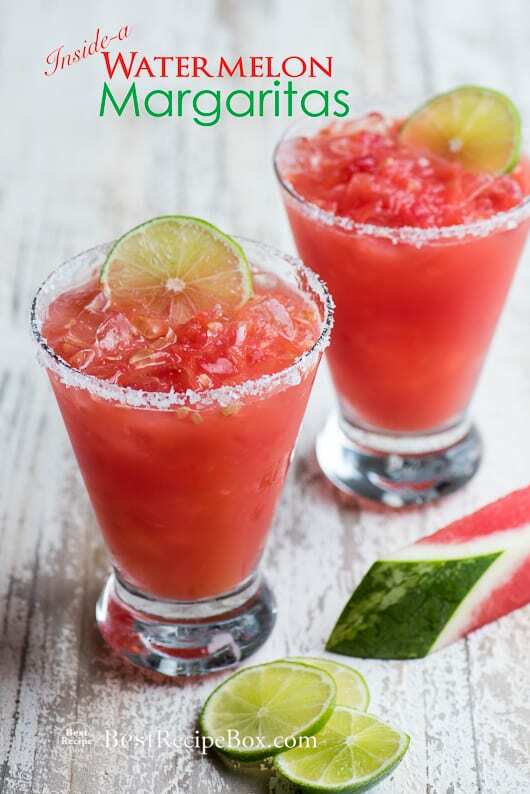 It’s a favorite margarita recipe with refreshing fresh watermelon! Holy cow this margarita is so much fun and it’s not just any ordinary margarita recipe nor is it any standard watermelon margarita. It’s actually made inside the watermelon and not in a blender. Ok, it’s totally cool to see it happening and though you get more chunky pieces (depending on your blender power) it’s still super delicious. Hand held blender works fine and you just have to blend a little longer if you want a more liquid texture. For the most smooth and less chunky results, we like to use our immersion blenders which are absolutely one of our favorite kitchen tools. Immersion blenders are super fantastic because not only are they powerful, they really can break up the watermelon chunks inside the watermelon. And of course, they’re not just useful for watermelon margaritas! They’re perfect for blending soups that are in a pot so you don’t have to transfer then into a blender then back into the pot. 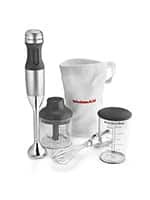 There’s different brands of immersion blender and you can research which you like better. But they’re all super awesome to have handy in the kitchen, especially for this watermelon margarita recipe. 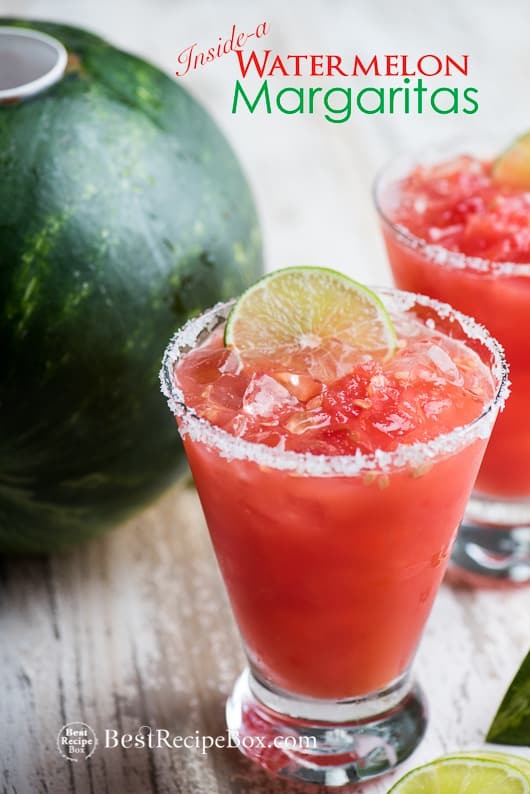 You can definitely customize this watermelon margaritas recipe to your taste. Like more tequila? Then go ahead and add more! Go ahead and make it at your next Summer party and guaranteed it’ll be a hit. Everyone will have a blast watching all this happen in front of their eyes. It’s just a fun and totally different way to serve watermelon margaritas. And yeah, there’s easier ways but so what? This is fun to watch, entertaining and you’ll be on everyones Instagram. 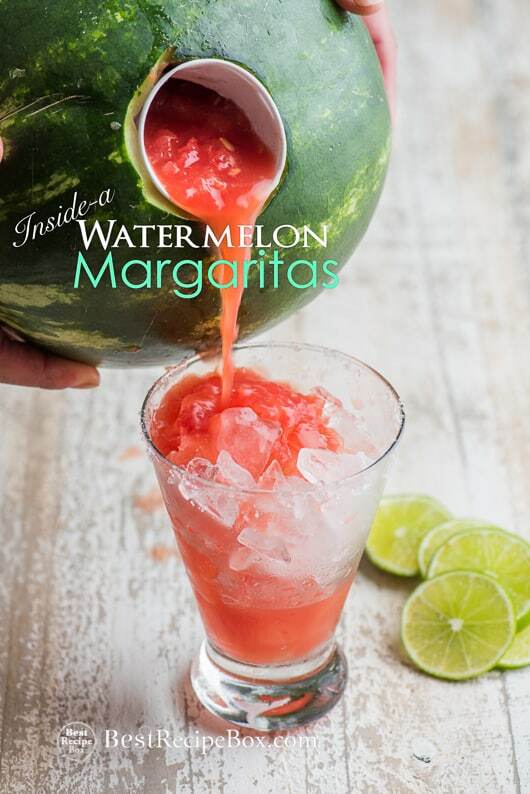 You’ll be the famous friend who made a ton of margaritas inside the watermelon. We also call it the Party Watermelon because literally, it’s a total party behind it. Also, don’t forget that this doesn’t have to be a boozy drink. 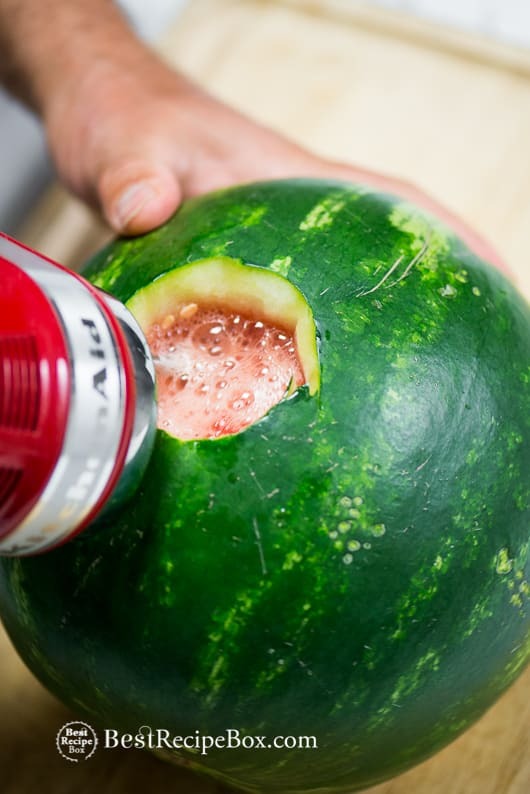 You can easily serve it to kids too without all the booze and they’ll have so much fun seeing their drink pour straight out of a big watermelon. Summer can totally be fun and refreshing. Do it! And if you love fresh pineapple, you’ve gotta try these awesome pineapple margaritas! 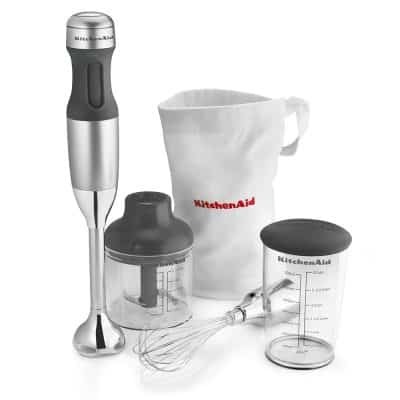 KitchenAid Cordless Immersion Blender – One of our favorite tools in the kitchen (or out in the party making Inside-a-Watermelon Margaritas). Love that it’s cordless. Love the chopper accessory. 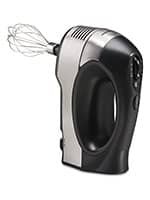 Hamilton Beach Hand Mixer – Simple and always handy. Doesn’t quite reach deep enough for a moderate sized watermelon, but works great for the smaller ones. 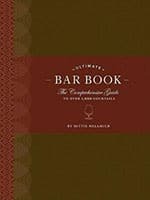 The Ultimate Bar Book by Mittie Hellmich – Truly lives up to it’s title. We have dozens of cocktail book, some by great bars, other very cool and craft. This is the one we actually make the cocktail from. It is the ultimate cocktail book. If you have the fridge space, chilling the watermelon the night before will give you a quick chill on the margaritas. The ingredients are to taste, so add as much as you like based on your personal taste preference and adjust as needed for different sized watermelons. A watermelon about 7-10 pound will be a good size that will allow the beater blades from the hand mixer to reach all the way through and around the inside of the watermelon. If your watermelon is any larger, you might need to use an immersion blender with a longer reach or use the drill and coat hanger method. Watch the video on our website to see how we made these. Hand held blender works fine and you just have to blend a little longer if you want a more liquid texture. For the most smooth and less chunky results, we like to use our immersion blenders. Add tequila, lime juice, and orange liqueur. Insert the beater blades back into the watermelon to mix the margarita and combine all the ingredients.